Despite Apple’s best intention to tout the design similarities between the iPod and the iMac, the two are essentially different monsters. 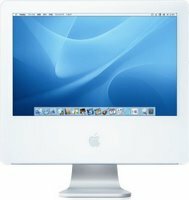 The best way to describe the new iMac G5, to borrow a phrase from Sun Microsystems, is that the display is the computer. Like the previous generation of iMac, the iMac G5 follows the natural evolution of computers that are getting slimmer. The entire system, enclosed in an acrylic frame around a snow-white bezel, sits on a small pedestal that allows you to reclaim much-needed workspace. While many Apple fans have lauded the iMac G5’s aesthetics, I am not entirely convinced why it needed to go through this transformation. When the first generation of iMac was redesigned, it made sense because the iMac G4 became more compact and more versatile with its swivelling screen. In comparison, the iMac G5 is less flexible, since the screen can only tilt forward and back. To move the screen sideways, you will have to manually adjust the base, which isn’t easy considering the weight of the display. Coming from Apple, you would have expected a more elegant way of doing things. In other areas, the iMac G5 also sacrifices functionality for form. All the connectivity ports, along with the power button, are lined up nicely on the back of the display. Apple boasts that the backside of the iMac G5 is better looking than the front of most other PCs, but it’s a pain to keep reaching around to plug things in or turn on the machine. And if you opt for the iMac G5 VESA wall mount, this becomes even more challenging. The iMac G5, however, provides convenient access to internal components. The case is easy to take apart – simply unscrew three captive Philips-head screws and you will have complete, unfettered access to the innards. Unfortunately, there isn’t much you can upgrade – you can install an AirPort Extreme card or add more RAM (a wise move if you plan to do a lot of heavy lifting like video editing) into the lone free slot, but that’s about it. Still, the interior is a model of efficient design. 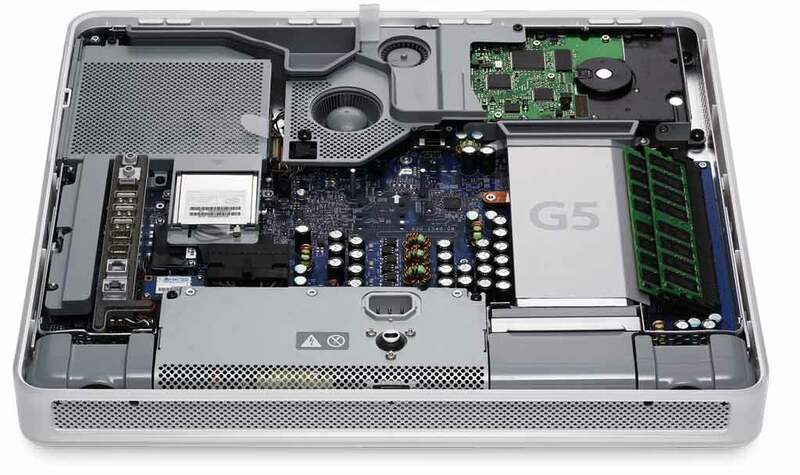 There’s no power brick to ruin the real estate (a common sight within Wintel machines) and operation is quiet even though three thermostatically controlled fans are working to cool different zones in a scheme much like that of the Power Mac G5. The iMac G5 comes standard with Apple’s iLife suite of software, GarageBand music composition application, as well as two simple but fun games – Marble Blast Gold and Nanosaur 2. Migration software is now included, so you can easily transfer files and settings from an older Mac. The integrated downward-firing speakers are fine for routine computing and music use, but they are light on bass. Overall, the iMac G5 is still more about style than substance. If you have a soft spot for sleek, minimalist décor, this machine may be what you’re looking for.